This Bordeaux property found the inspiration for its name from its location. Du Tertre is situated on the tertre. Tertre in French means hillk or rising ground, which is where the estate is located. With a history dating back to 1143, du Tertre is one of the oldest properties in the Left Bank of Bordeaux. At one point in time, the estate was known as Tertre d’Arsac, due to the amount of vines located in the commune of Arsac. Le Tertre passed through several different owners over the centuries. It was owned by the Arrerac family and Marquis de Segur. 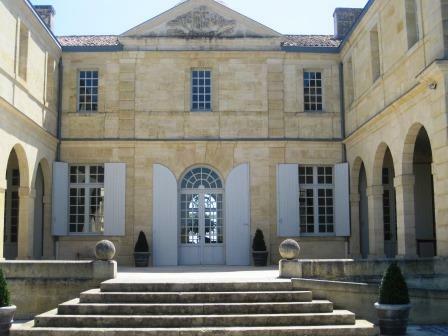 In fact during the 1700’s, what we know of as Chateau du Tertre was owned for a period of time by Pierre Mitchell, a noted Bordeaux glass blower. This is a good bit of trivia for you, Pierre Mitchell is known to have created the Jeroboam bottle. It is thought that some of the production of Chateau du Tertre was estate bottled in the 1700’s, due to the glass blowing ability of the owner, Pierre Mitchell. Le Tertre, as the estate was known in those days, was a popular wine in the Dutch market was sold to Henri de Koenigswarter of the Netherlands. It was during his tenure that the name was changed from Chateau Le Tertre to Chateau du Tertre. The famous estate was also owned by the Cruse family in the early 1900’s. By World War II, the reputation and production of Chateau du Tertre had declined. In 1961 Chateau du Tertre was acquired by Philippe Gasqueton. If the Gasqueton name sounds familiar to you, it should. Philippe Gasqueton was quite well-known and experienced as he owned Chateau Calon Segur in St. Estephe as well. Philippe Gasqueton replanted the vineyards of du Tertre as well as renovated the original chateau and modernized the entire winemaking making facilities. Following the death of Philippe Gasqueton in 1995, his widow sold the property to Eric Albada Jelgersma and Louise Albada Jelgersma. The Jelgersma family was already quite established in Bordeaux, as they were the owners of another Margaux property, Chateau Giscours. The Jelgersma family still owns Chateau Giscours today. The young, Alexander van Beek was brought into manage Chateau du Tertre. It was under the direction of Alexander van Beek that things began turning around for du Tertre. One of the first big decisions made by van Beek was to discontinue machine harvesting and move to picking by hand. Alexander van Beek did not stop there as you will learn. The 80 hectare Chateau du Terte vineyard is planted to 55% Cabernet Sauvignon, 20% Merlot, 15% Cabernet Franc and 5% Petit Verdot. The du Tertre vineyard is planted on one large single block. This is one of the largest single blocks in Margaux, as well as in all of the Medoc. It is important to note that their vineyard is also one of the few estates that is the same size today, as it was at the time of the 1855 Classification of the Medoc. The terroir is mostly gravel, with some sand soils on two, gentle, sloping hills. The elevation close to the chateau graduates up to 27 meters, making it one of the highest peaks in the Margaux appellation. The location for much of the vineyard is situated close to a forest, which produces a slightly cooler, micro-climate. The cooler ambient temperature adds more freshness to the wines. Geographically, they are next to their sister property, Chateau Giscours. In fact, only a small stream separates the two vineyards. Their best parcels are located just behind the chateau, and as well as on the peaks of their gravel hills. They have 53.5 are hectares under vine. The remainder of du Tertre is devoted to verdant gardens, forests and one of the most beautiful swimming pools I have ever seen. There is sculpted art scattered in the gardens. The vineyard density is planted to 9,200 vines per hectare. On average, the vines are close to 40 years of age. The estate also has older vines that are almost 70 years old. The oldest vines are their Cabernet Franc, which they are using for their own Massal selection. At Chateau du Tertre, experiments started place in 2008 with biodynamic farming techniques with an eye to eventually becoming 100% biodynamic in the future. By 2017, 55% of the vineyard is being farmed using only biodynamic farming techniques. The estate is in the process of converting to exclusive use of biodynamic farming techniques. This is being on a parcel by parcel basis. Each time a parcel is replanted, it is being done using biodynamic farming at the current higher levels of vine density. For the vinification of Chateau du Tertre, the wines are vinified in a combination of 24 wood tanks, 10 concrete vats, 4 small cement eggs and 16 stainless steel tanks that range in size from 10 hectoliters up to 180 hectoliters, which allows for true, parcel by parcel vinification. The thermoregulated vats are filled by gravity. Chateau du Tertre vinifies on a parcel by parcel basis at temperatures ranging from 25 degrees to 30 degrees Celsius. Chateau du Tertre was one of the first Bordeaux wine producers to begin using the cement Nomblot egg shaped, cement vats. The estate uses 4 egg shaped vats in total. These vats add more minerality to the wine. 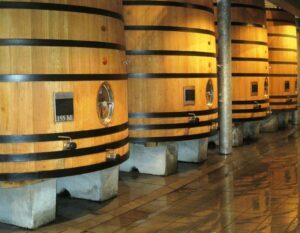 Malolactic fermentation takes place in a combination of French oak barrels and vats with 40% of the Malolactic fermentation taking place in barrel and 60% taking place in concrete vats. Chateau du Tertre spends on average 18 months in 50% new, French oak barrels and is lightly fined with egg whites. The property produces a second wine, Les Hauts de Tertre. Production of Chateau du Tertre is on average close to 16,500 cases of wine per year. The best vintages of Chateau du Tertre are: 2018, 2017, 2016, 2015, 2014, 2012, 2010, 2009, 2008, 2005, 2001 and 2000. Since 2000, the team at Chateau du Tertre, headed by Alexander van Beek, has truly been making all the right moves to improve the quality, texture and character in the wines, vintage after vintage. Starting with the 2014 vintage, Chateau du Tertre began producing a dry white Bordeaux wine, “Tertre Blanc”. The wine is produced from a unique blend of Sauvignon Blanc, Chardonnay, Viognier and Gros Manseng. The wine is sold as a Vin de France because most of those grapes are not approved for planting in Bordeaux. The nose is all about the white peach, flowers, cantaloupe, vanilla and citrus peel. The wine is unctuous and lively, with a blast of yellow citrus and peach in the finish. The unique blend is made from 30% Viognier, 20% Sauvignon Blanc, 20% Chardonnay and 20% Gros Manseng. The wine was vinified in stainless steel and barrel and aged in 100% new, French oak barrels. Walk into a flower store with a basket of cherries and you get the idea, especially if you add peppery spice, tobacco leaf and wet earth. Soft, polished, refined and sweet, the tannins are silky, the fruits are juicy and there is length. This is going to be delicious in its youth, and it will age well too! From a blend of 75% Cabernet Sauvignon, 10% Merlot Franc, 10% Cabernet Franc and 5% Petit Verdot, the wine reached 13.5% alcohol with a pH of 3.9. The harvest took place from September 14 until October 2. Due to the frost, they lost 35% of the crop. The combination of pomelo and flowers is perfect this year. From there you find lemon grass, tangerine and citrus peel. Bright, crisp and refreshing, there is body and vibrant citrus in the finish. The unique blend is made from 50% Chardonnay and 50% Viognier. The wine was vinified in stainless steel and barrel and aged in 100% new, French oak barrels. Fresh, spicy, peppery, ripe red fruits with right amount of earth, flowers, and leafy herbs open the soft textured, medium/full bodied, silky wine. Give it a few years for its seductive qualities to shine. Earthy, spicy, fresh, vibrant, sweet and loaded with crisp, ripe, red fruits, earth, tobacco and floral nuances, gives this a decade to develop its secondary flavors so it will show what it's really made of. Flowers, cherries, smoke, thyme, cassis and silky fruits all over the place in this medium-bodied, fresh, sophisticated wine. From a blend of 75% Cabernet Sauvignon, 10% Merlot Franc, 10% Cabernet Franc and 5% Petit Verdot, the wine reached 13.2% alcohol with a pH of 3.7. The Merlot was harvested from September 27 until October 10, the Cabernet Sauvignon from October 15 to October 19 and the Cabernet Franc from October 10 to October 13. The Petit Verdot was harvested in one day, October 15. Juicy, citrus, honeydew, flowers, vanilla and spice with tropical fruit accents get the wine going. Round, sweet and with some flesh, the fresh, citrus in the end, keeps it refreshing. 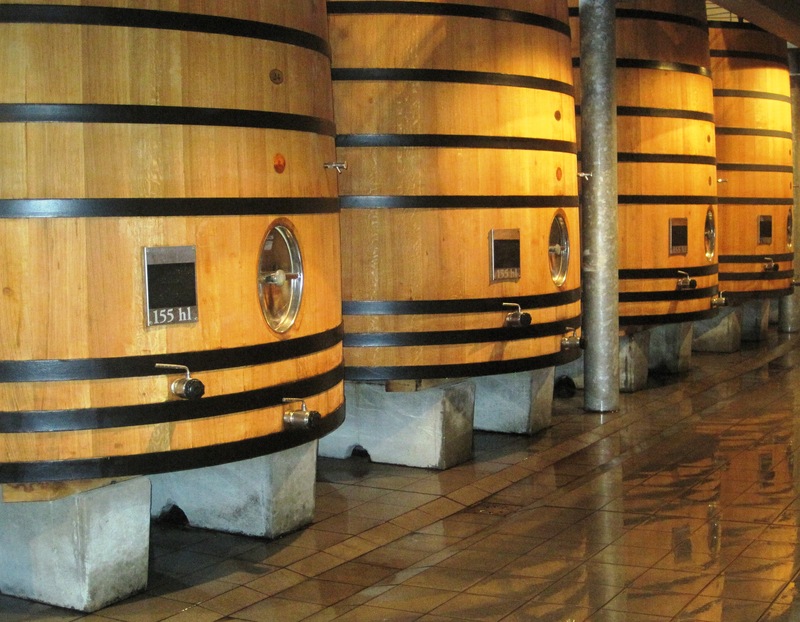 The wine is vinified in stainless steel tanks and barrel aged in 100% new, French oak. The wine comes from a unique blend of 25% Chardonnay 25% Gros Manseng, 25% Viognier and 25% Sauvignon Blanc. Juicy, sweet, and most important, round and silky, the wine feels as good as it tastes. With its satin characteristics, here, there is a charm, and even sexiness you have no trouble spotting all the way through to the spicy red fruits in the finish. Now we are talking. The red fruits are bright, sweet, soft and silky. The floral notes, coupled with earth, forest and kirsch a treat. The pure cherries in the soft finish offer polish and refinement. Showing better than ever, this has a lot going on here. The wine is conceentrated, sweet, fresh, vibrant, silky and complex. This will age and evolve quite well too. Honeyed grapefruit, nuts, flowers, lemon peel and orange marmalade aromatics present a unique profile. Polished, sweet, yet fresh and vibrant, with a dominant citrus character, this is a fun, early drinker that will stump everyone in a blend tasting. From a unique blend of 42% Chardonnay, 31% Gros Manseng, 16% Viognier and 11% Sauvignon Blanc, the wine is vinified in stainless steel and barrel and aged in 100% new, French oak barrels. Forward in style, this will offers its charms young. The fruit has a softness, sweet and fresh character that is quit successful for the vintage, and will drink well young. The wine was made from a blend of 58% Cabernet Sauvignon, 20% Cabernet Franc, 12% Petit Verdot and 10% Merlot. Bright, fresh, vibrant, energetic and spicy, with loads of tobacco, earth and herbs on top of sweet, fresh cherries are all right there, in this medium bodied, charmer. Light in color and fruit, the wine is already starting to show some secondary characteristics. Light, but fresh and sweet, drink this now for its fresh, sweet, red berry and peppery character. The wine was made from blending 80% Cabernet Sauvignon, 10% Merlot, 5% Cabernet Franc and 5% Petit Verdot. The amount of Cabernet Sauvignon in the blend for this vintage is a record for the property. Light in color, medium bodied and forward, there is good freshness to the bright, red cherries and strawberry tones that carry through from start to finish. Here you find smoke, cherries, tobacco and earth. Medium bodied, fresh and with polished fruits in the finish, give this another 5 years to develop. The wine was made from 55% Cabernet Sauvignon, 27% Merlot, 11% Cabernet Franc and 7% Petit Verdot. Fresh, medium bodied lively, crisp fruits, flowers and spice are found in this soft wine. Developing rapidly, the wine already shows secondary characteristics. Medium bodied, fresh but light on the palate, there is an herbal note that is quite strong in the otherwise, fresh, silky finish. The wine was made from 60% Cabernet Sauvignon, 20% Cabernet Franc, 10% Merlot and 10% Petit Verdot. Medium bodied, soft, easy going, lighter style of wine. The earthy, truffle and dark cherry nose is more complex than the red and black plum finish. Earthy, spicy, blackberries and black cherries create the aromatics. Fresh, clean, zippy fruits are found in the long finish. The final blend turned out to be 70% Cabernet Sauvignon, 20% Merlot and a healthy 10% Petit Verdot. Chocolate, mint, blackberry, cassis, stone and spice scents, structured, polished, fresh, ripe and pure, this has improved since tasting it last year. Lush, supple, elegant and fresh, the wine tastes, smells and feels great, with all its sweet, lush, fresh fruit and plummy, chocolate touches. You can drink this now, but it's going to better in 3-5 years. The wine was produced from blending 55% Cabernet Sauvignon, 22% Merlot, 15% Cabernet Franc and 8% Petit Verdot. Truffle, stone, espresso, blackberry, chocolate and menthol in the nose. Sweet, supple and filled with plush ripe, blackberry and plums, this is showing better than when it was tasted earlier this year with the UGC. This is another 2009 Bordeaux that has fleshed out and improved since it was first tasted back in April, 2010. Licorice, coffee blackberry and plum aromas lead to a fresh, ripe, sensuous, well priced Margaux wine that was produced from a blend of 55% Cabernet Sauvignon, 22% Merlot, 15% Cabernet Franc and 8% Petit Verdot. This has developed well since it was tasted in barrel. Truffle, licorice, cassis, black plum and spicy scents lead to an elegant, soft textured Margaux that ends with sweet plums and black cherries. A blend of dark and deep red cherries is at the wines core. The tannins, are soft, the fruit is bright, crisp, fresh and peppery. Give it a few more years and this beauty will be even better. Still on the young, fruity side of the style range with loads of black cherries in the mouth and nose, you find more maturity in the finish, with its soft, silky, elegant tannins and freshness. Give it a few more years and will be even better. The wine was produced using 52% Cabernet Sauvignon, 33% Merlot, 15% Cabernet Franc. With perhaps the highest percentage of Cabernet Franc in the Medoc, (20% Cabernet Franc was used in 2008) Du Tertre produces a unique style of Bordeaux wine. The wine expresses tobacco, spice, herbs and cassis. Soft in texture, the wine ends with a red and black fruit filled finish. Showing its age in the ruby, tea colored hue, the wine shows flowers, light red fruits, tobacco and earth. Light in fruit, but elegant in character, with a light, red fruit, herb and English breakfast tea finish. The wine requires drinking up, sooner than later. This is the penultimate vintage produced in the old cellar in large vats without temperature control. The wine was made from a blend of 50% Cabernet Sauvignon, 35% Merlot and 20% Cabernet Franc. With the tell-tale strictness of the vintage, the finish is still tannic. There is fruit, the fruit is ripe, and fresh, but the wine requires several more years before it softens and gains enough secondary nuances. The wine was produced from 50% Cabernet Sauvignon, 30% Merlot and 20% Cabernet Franc. Medium bodied, with a lot of development in the color, the wine offers a truffle and red berry nose, soft textures and earthy, fresh red plums in the finish. This is a ready to drink charmer. Medium/full bodied, richly textured with a lush character to the fruit and tannins. Silky, sensuous and charming, the fruit feels great, the finish offers freshness and length along with tension. You can drink this now, or age it for further development. The wine was made blending 45% Cabernet Sauvignon, 30% Merlot, 20% Cabernet Franc and 5% Petit Verdot. Already open and serving up its tobacco, earth, cherry and wild strawberry charms, the wine has a softness to the tannins on the palate. ,The end is focused on its fresh, bright and almost, crisp, cassis and cranberry finish. Smoke, oak, licorice and ripe, black cherries lead to a still youthful, tannic Margaux that wants a bit more time before it's red berry finish softens and gains more complexity. The wine is showing much better than it did in my last tasting few years ago. Earthy, black pepper, smoke and cassis aromatics are found in this wine. Full bodied and concentrated with cassis and spice flavors, the dark berry finish was a little short. Leafy tobacco, smoke, earth and cherries define the perfume. Ready to drink, the fruit is fresh, herbal and with a peppery complexity. There is a dryness in the otherwise charming finish. The wine was produced from blending 42% Cabernet Sauvignon,38% Merlot and 20% Cabernet Franc. Cedar wood, leaf, forest floor, herb and cassis, medium bodied, the tannins are resolved, the ready to drink wine ends with light, clean strawberry notes. Fully developed, the wine is medium bodied, with a soft entry and a distinctive herbal character on the palate and in the finish, especially in the end notes. . Classic in style is a good way to define the vintage here. The wine was made from a blend of 40% Cabernet Sauvignon, 35% Merlot and 25% Cabernet Franc, which is the highest percentage used in the blend. Cigar wrapper, wet earth and sweet cherries work together to create a medium bodied wine with freshness, and sweet, ripe, spicy fruits. The wine is polished, peppery, elegant and with the complexity of sandy tannins in the finish.. This is really coming on strong. The floral, spicy, fresh, red and dark berries with just a hint of cigar box is shining on the nose. Soft textured, fresh, spicy, earthy, sweet cherries deliver the goods in the finish. With smoky cocoa, dark cherries and truffle essences, the wine is soft, elegant and refined. Medium bodied, with a spicy edge, the fruit has freshness and vibrancy, with just a hint of leafy, herbs in the finish. From a blend of 45% Cabernet Sauvignon, 30% Merlot, 20% Cabernet Franc and 5% Petit Verdot, this is the first vintage in a few years to add any Petit Verdot. Forest floor, pepper, earth, cassis, truffle and tobacco notes lead to a wine that is on the austere side of the style range. Tannic and firm, the wine ends with crisp, fresh, cassis and cranberry flavors. Time might help soften the wine. With a mature color showing ruby with tea accents, the wine is medium bodied, with an earthy, spicy, truffle and red berry character. Light, silky, bright and spicy, with a light, fresh, peppery, red berry character in its finish. This is fully mature and requires drinking. From a blend of 60% Cabernet Sauvignon, 30% Merlot and 10% Cabernet Franc, this is the debut vintage produced in the new, modern cellars. Cigar wrapper, earthy, truffle cocoa and red fruits on the nose, the wine is medium bodied, soft in texture, with a short finish that offers cherries, spice, herbs and some tartness. If you are sitting on any bottles, this is a wine to drink sooner than later, before losing the remainder of its fruit. The final vintage produced in the original cellars with large vats and without temperature control. The wine was made from blending 45% Cabernet Sauvignon, 35% Merlot and 20% Cabernet Franc. Cassis, smoke, cedar, tobacco, spice and truffle aromas lead to a wine that has reached maturity. This needs to be drunk sooner than later. Medium bodied with tobacco, spice and cassis, this fully mature wine is starting to drop its fruit and requires consumption. Light ruby with tea colors, the wine offers truffle, tobacco, cedar, cassis and cherry scents. Medium bodied, this is fully mature and needs to be drunk up.